This is my friend, Khalid. This is his baby, Mr. Bean. For my last backpacker project, I lived in Amsterdam for 6 months in a really great neighborhood. There was a coffee house called Mr. Bean right across the street from my apartment that I visited on the weekends for their drinks and tasty sandwiches. I had the pleasure of connecting with the owner, Khalid Gaddur after some small talk while I waited for my drink and salad. You can read the full story of how we met here. After speaking for a while, he agreed to have a conversation with me for my blog. We talked about his home country, working and living in Amsterdam as a non-native Dutch person, inspiring travel moments, and life in general. I learned that he had a long history of being in the hospitality industry and had worked his way up the hotel ladder. 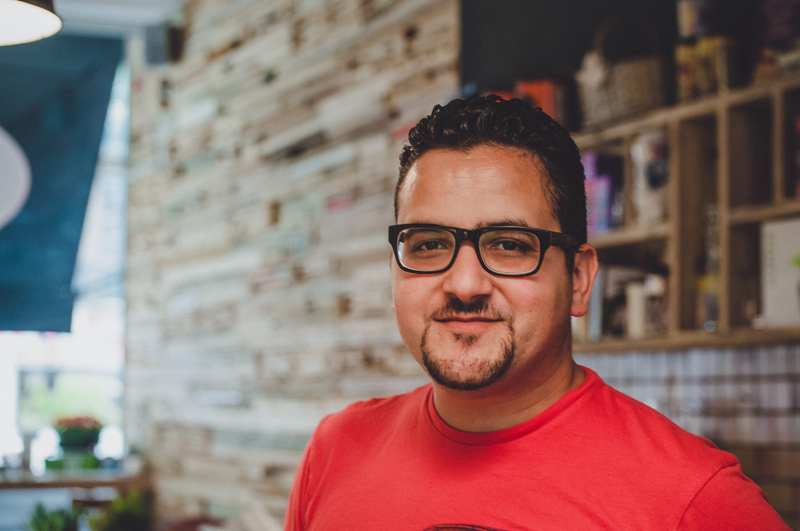 From cooking internships to managing at McDonald’s to hotel general management and with hard work and dedication, Moroccan-born Khalid was able to build something in Amsterdam for himself and to support his family. This is our conversation. Khalid: I was always looking to create my own concept. Starting your own business, it’s your baby. You can give it your own twist. You can raise it up how you want. I wanted to create an environment that is cozy, where people feel at home. I think it worked out quite fine because that is exactly what I have – a cozy place. What is the concept behind Mr. Bean? It’s a concept where everyone knows each other. I have a role here. Every time someone comes in.. for example you came in, I introduced you to someone else and now here we are. You bring people together, you speak together… because we are living in a time where everyone looks at their phone and there is no more social contact anymore. At Mr. Bean, there is social contact. I do everything to make people feel at home. Sometimes you see people are alone and when I involve them in my conversations, they love it and the group is getting bigger. In the winter, this whole place is full. Is Mr. Bean your dream? My dream is to own my own small hotel in a sunny country, where we have mountains and sea where I can support my family. For less, I won’t do it. How did your upcoming road trip to Morocco and Colombia with Gurian and Vera come about? Why not have a road trip to Morocco, put the car on a ship to Brasil and then have another from Brasil at the port with the car? We could drive through Brasil – Peru – Ecuador – Colombia. We got a car, an Alpha Romeo – it’s a small, old car that fits 4 people. We had a few conversations and one day another regular, Vera was sitting here and she was listening to us talk and asked if she could come. We were of course, surprised. We asked her what she was doing and she said she was doing documentaries and that this would be a really nice story to document. So we said why not?! She’s a professional, she knows how to make a documentary. Let’s do it. We found it a bit weird, because we could be killers, we could be psychos, but on the other hand, someone who trusts you, I think it’s quite special and the vibe was good. I love making a trip by car. I’ve done it for years. While you’re driving, you can do a lot of thinking. You have a sense of freedom. I always get the kind of satisfaction out of sharing something that is beautiful with other people. If I see something nice, I want to show it to people because it’s not only meant for me and Morocco is a beautiful country. It gives me a good feeling.. now we are talking about the trip again and it’s weird, there is a kind of excitement that goes on inside. Have you ever taken a trip or had an experience that changed you? To see how beautiful people can be and I’m not talking about their looks. The local people…you know you can see it. You think about how people can be so happy when they have so little and we have so much and we are not happy with our lives. That’s what changed my thinking. You don’t need everything to be happy. Thai people, for example, no matter how poor they are, they are always clean, clean clothing, always a smile on their face. It looks like they have no worries. I think Europeans are always worrying and when things are going well, they spend a lot of money. I’m very curious to see how South Americans look at the way of living and how they are. That always turns out really nicely. We meet a lot of interesting people and it’s fun. This is something that Dutch people would never do. They book their vacation now for next year without knowing what’s going to happen. It’s a very beautiful country. They have everything: beaches, mountains, nature, desert, ski, waterfalls. What I also like – the food is delicious. The culture is very rich. They have so many different cultures in Morocco from north to south, and all those cultures value family. Family relations are very tight. Everything goes around food. When they come together, they have a lot of food. Hospitality is #1 there. You can sleep at someone’s place without knowing them. That’s where I get my hospitality blood from. If you look at the top restaurants, the best waiters are coming from Morocco or Tunisia. They know how to do their job. What’s the difference between the culture in Morocco and Holland? The Dutch are more organized. In Morocco, there are also dark sides. Morocco is not a fairy tale. I’m just mentioning the good side, because that’s how I look at it. There’s a lot of poverty and unemployment. They are creative in finding ways to survive. They have like a million unofficial tour guides haha.. and a million poppers (people who try to get you to come into restaurants and get commission), there are also a lot of street children addicted to glue. So there are some sad things to see in Morocco, but I choose to see the good. I will confront Gurian and Vera with the dark side as well because they have to see it. You don’t see the dark side on TV and the travel shows don’t show you the dark side, but that’s normal because they want to promote the country. In the US I also saw a lot of poverty, but no one speaks about it. It’s important to show that side to people because it makes you more real. I’m not for giving a fake image. I’m not a joker. I like to give the real picture. In Morocco, you see people begging, you can see weird things, people hitting children on the street which they consider quite normal.. street dogs, how they are treated, it’s terrible, they would never treat a dog this way here.. and that’s the difference between Holland and Morocco… but you see a change. It’s getting better..
What are your thoughts on meeting people and making connections? You came in for coffee and salad and I made a mistake and gave you iced chai instead of coffee frappacino. So I struck up a conversation. I asked you where you are from and it went from there. I was totally surprised when you said you were making a travel blog and I thought, It’s like fate how we all meet. In a kind of way something always connects the conversation. I asked you where you are from originally and you said you were adopted and I made the connection to my friend who is adopted and so we kept the link going and now here we are, creating something. In an elevator you can’t make a conversation with a stranger.. too short. 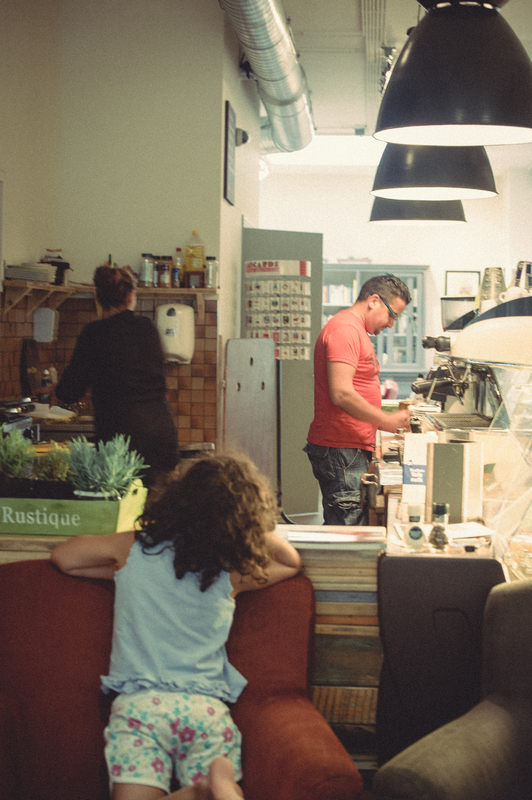 Coffee shop on the other hand… you can stay here all day. 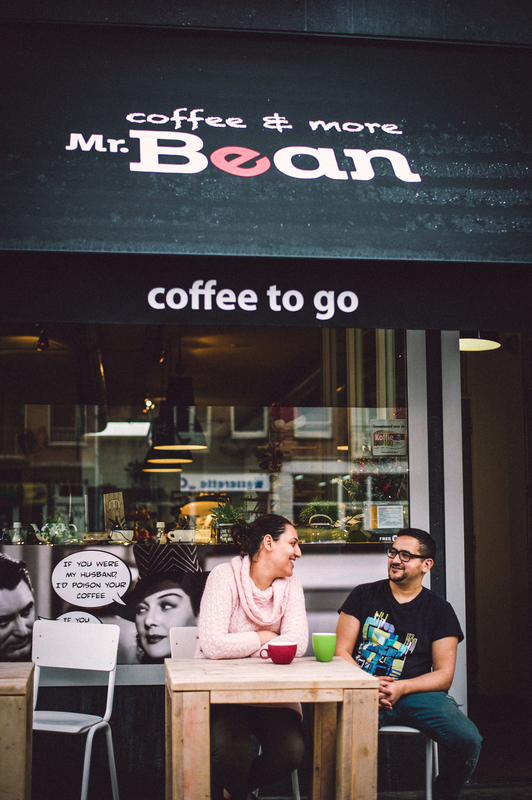 Khalid Gaddur is the owner of Mr. Bean in De Pijp in Amsterdam, the Netherlands.